“Refreshingly positive and life-affirming” (VICE); a “tour de force” (Mass Appeal); “wild and catchy” (Brooklyn Magazine); “exceedingly unique” (Wild Honey Pie); “fresh and inventive” (All About Jazz); “levitating on a bouncy, cloud of air” (Impose Magazine). From December 2009 to August 2016, EMEFE established itself as one of the most exciting bands to come out of New York City, through countless legendary live shows and 7 studio releases (including 2015’s EMEFE and 2012’s Good Future). Now, they reunite for one special June weekend, coinciding with the release of Live at Bryant Park, a document of their powerful final show as a band in August 2016. A Multi-Instrumentalist, producer and performer, Matt Carey is an up and coming talent that showcases a versatility, intention and quality of work that is poised to peak the interests of music fans worldwide. At 27 years of age, Matt has become a fixture in the North East U.S. Music Festival Scene and is well established internationally, now approaching his sixth year performing throughout Central America. 2016 saw the release of Matt’s debut full-length album, “Born into Babylon”. The album delivers a diverse sonic journey rooted in house music, weaving vibes, instruments and cultures creating a unique signature style. Live, Matt creates a multi-sensory visionary atmosphere utilizing his own vocals, analog FX and live instrumentation to bring an interactive and unique live performance. His productions consist of sounds, themes and instruments derived from a wide variety of places, times and emotions, creating an immersive audio journey. Musical style has been dubbed “Earth Spirit Revival”. His songs are prayers, for human beings to come together in this time, to build together for the next generations. He is the creative visionary behind PermaJam (a model for festivals that transform the land and unite communities). He has dedicated the last 8 years in service, organizing for environmental and social causes, helping to build farms and permaculture projects. Barika is a 6 piece funky, dubbed out, psychedelic West African flavored band from Burlington, Vermont. The group is led by Craig Myers who, in addition to leading Barika on the N’Goni, is also a current member of Mike Gordon’s band, and was one of the original founding members of Rubblebucket. He has performed alongside many artists and bands including Midnight, Toubab Krewe, Djeneba Seck, and John Brown’s Body. Hanifa picked up the guitar 20 years ago to accompany her poetry and songs and has been on a ride of spirit, healing, and soul connecting ever since. She is answering her calling as an artist and soul teacher blending by her sweet songs with somatic healing and guided meditations. Hanifa Nayo- means the Bringer of Happiness With Whom I Go in Yorubic. Native to Detroit and currently living in New Haven, CT Hanifa has been bringing the happiness since 1977. Hanifa is a spoken word poet, creative writer, storyteller, and intuitive energy healer. Join healing songtress Hanifa Nayo offering medicine in her words, mantras,and songs. 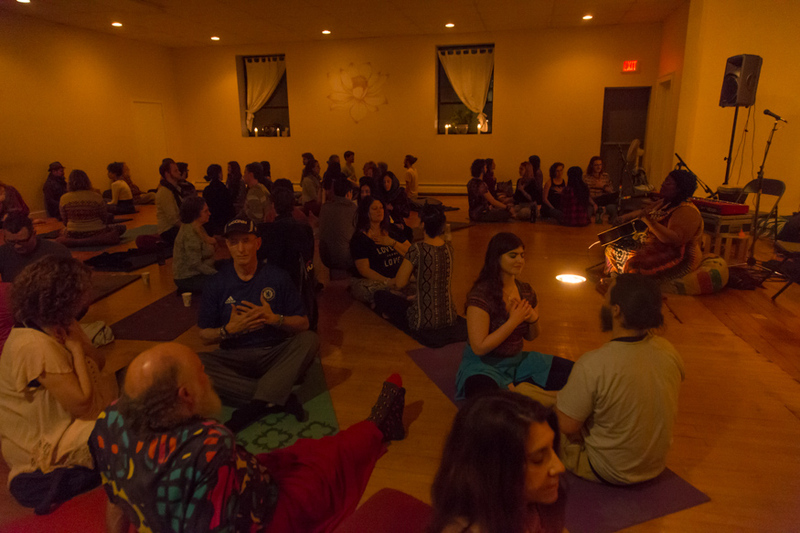 Circle up with her for a radical healing session called Mantras For The Revolution- experience deep connection, sacred play, release, and a sweet energetic tune up!